As promised in my “career possibility” post, here is a shot of our newest reptilian addition to the family. I have been watching for him in vain for some time now, but tonight I guess he decided he wanted to show off for company . 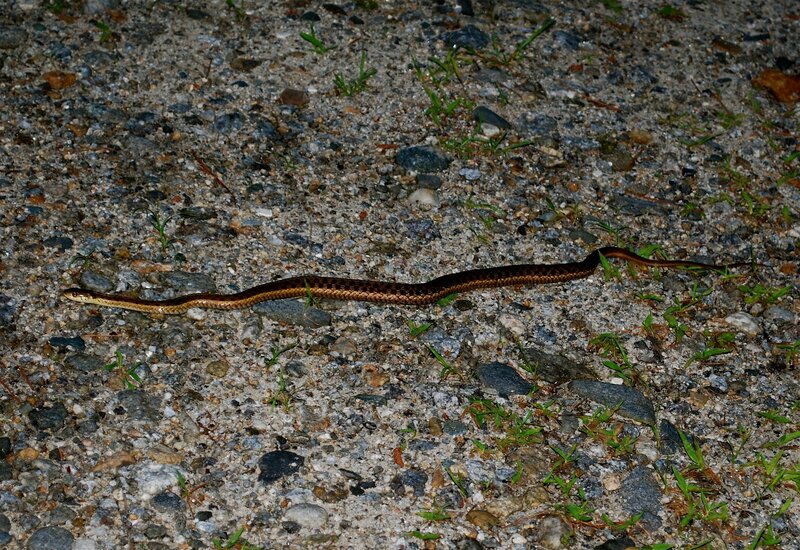 . . so as we headed out for our post-dinner stroll, we found him slithering along on his own evening jaunt. it’s a bird: it’s a . . . lily? 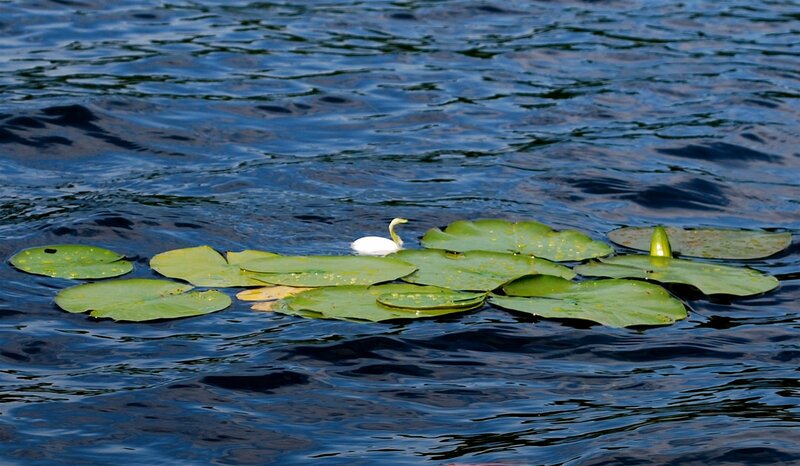 While out kayaking today, we noticed a swan . . . and then realized that, in fact, there are no swans on this lake. It was actually a lily that rather strikingly resembled one: don’t you agree? Sometimes it’s worth it to take a risk. Had I been listening to my inner voice of prudence this afternoon, for instance, I would certainly never have carted my camera into the kayak with me: what novice paddler in her right mind would take such a valuable creative tool into the middle in a lake? 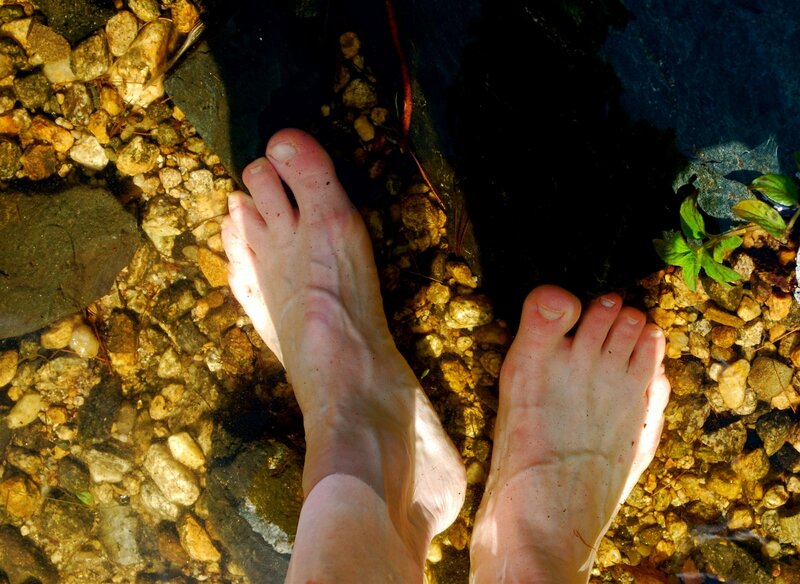 But I just could not shake the nagging itch to take a water photo shoot. And had I not done so, I would have never paddled towards the brilliant burst of bluish-purple of a lily sitting pretty in its pad. 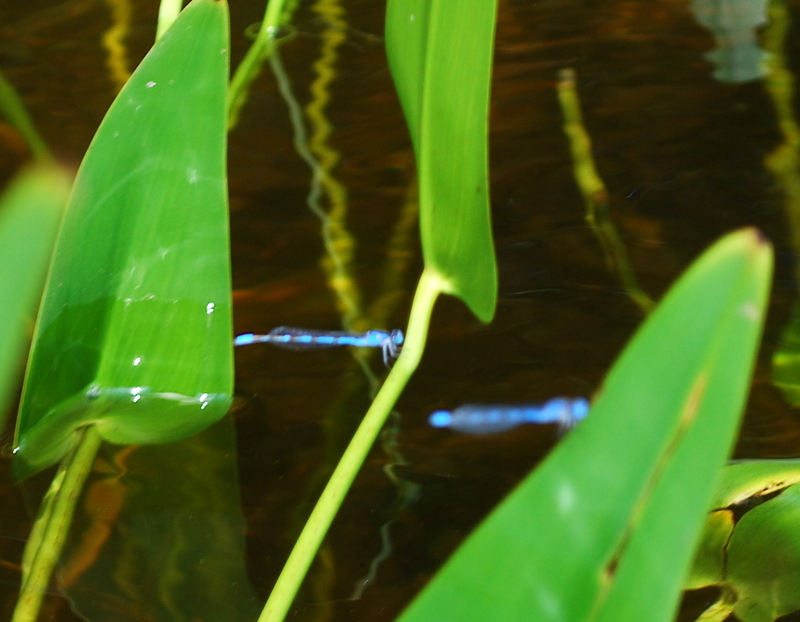 I would then have missed the sight, upon nearing the flower, of a flurry of dragonflies, perfectly matching its hue as they lit upon the neighboring leaves. 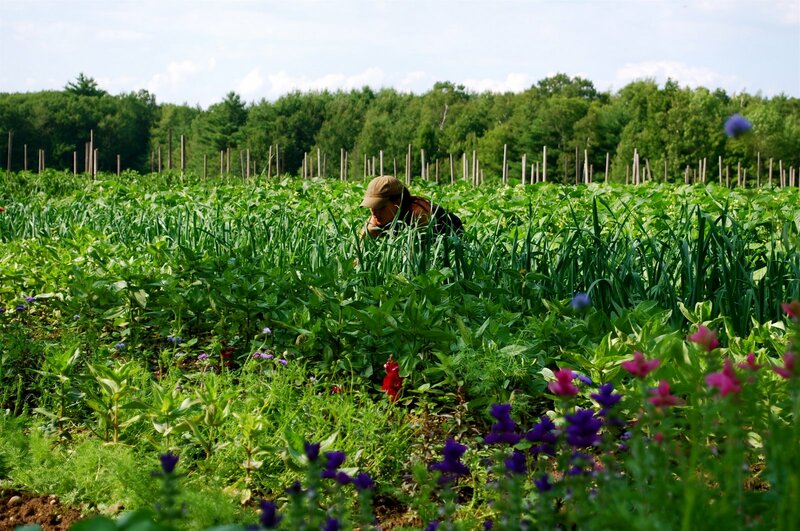 So remember that farm shot from June 20 ([“in the [farming] flesh)? Today I was there at that farm again, and was struck by how obvious the passage of time is, there in the gardens. I took this photo to illustrate that fact, as this similarly lovely female farmer is in the same position, location-wise, as was the friend in the June post. How does your garden grow? Quite remarkably, I dare say! As you requested feedback, I couldn’t help sharing one snippet from the rounds Mom and I made today. I don’t know if you were familiar with the devotional they did today, but it was about opening our eyes to poverty, and to the different ways it manifests itself in our world. At one site, we were listening in and, after the time of minute-long reflections on each of the 5 facts about poverty, the question was raised as to how we reacted personally to them. Most were the expected sorts of replies concerning how strange it seems that life reality for many involves spending great deals of time and energy expended for things that we take for granted [drinking water, food, not risking malaria with each mosquito bite, etc]. But then one young man, in the most strikingly matter-of-fact manner, said that the AIDS statistics made him think of his mother. After a brief moment, he continued, saying that she had died of the disease in 2002 . . .
How fittingly stark of a reminder, it seemed to me, that we need not search for long for “poverty” and “sickness,” as in its various forms it is as close to us as our next-door-neighbor. Here is a photo to go with this event, as it is of 2 of the group members reflecting, right after the other had shared his perspective. 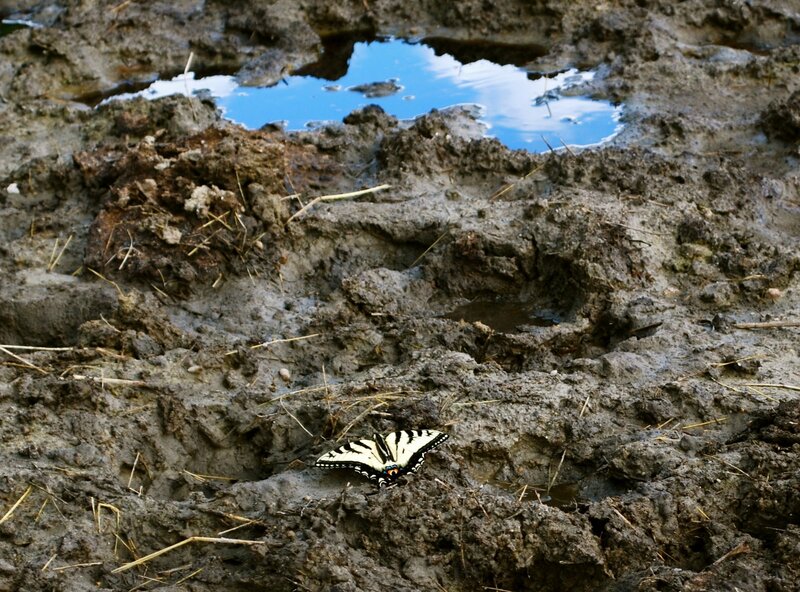 This particular post is about the fact that, as we tramped through the mud, Mel pointed out a striking butterfly; it had, as she noted, chosen a rather odd spot in which to linger. I agreed, but also found it beautiful, in a strange and unexpected sort of way . . .
Lou and I enjoyed a mini-adventure the other night. During dinner, the neighbor called, a bit frantic after multiple calls to AWOL family members. This neighbor is actually quite a hardy sort: a no-nonsense New Englander who is accustomed to taking care of her family in a quite self-sufficient manner. But this time she was perplexed as to how to coax a 3-foot snake out of her bedroom. Not knowing what kind it was, she was not ready to get close enough fish it out of the corner where it had been persistently camped out for the day. She explained that she was only calling for help as she could not envision falling asleep with it there: daytime was one thing, but overnight was quite another. Sure enough, we emerged victorious a bit later that evening: Lou’s garden-gloved hands grasped firmly around the neck of a quite handsome, and good-sized, Garter. We decided we should go into business together, as we apparently made quite a team of snake handlers. And to round out the evening’s successes, we returned to Mom and announced that we had a 4th “child” for her to add to her brood of garden-dwelling Garters. Stay tuned for a visual aid . . .
"sunshine on our shoulders . . ."
Tonight I teased Lou for knowing how to treat his women right–my mother and I, that is. We were out for a fine evening, being wined and dined in style . . . true to our family’s style: it was a busy day for us all, you see. My work day ended slightly early, as I had to head out a bit before usual for a doctor’s appointment. Mom was accompanying me for the exciting outing, after her weekly dump run. Rendezvousing in the Hannaford’s parking lot, we consolidated cars and continued for the hour commute to the clinic. A few directional issues later, we were headed back to our planned meeting point. Lou had gone from work to the nursing home to visit his mother and, afterwards, he joined us back in the parking lot. Thanks to cell phone correspondence, our evening was well synchronized: Lou hopped from the subaru into the jeep, I doled out the plastic utensils from the back seat, and we ate our pita chips and pasta salad in the grocery store lot, Lou in his srubs and mom with her hair still damp from the pool. First course in our “progressive dinner. Our intended next stop was down the road to the donut shop, to use a gift card . . . but it had already closed for the evening, here in our bustling metropolis. So we settled for a convenience store, where we got hot chocolate from the vending machine. Lou and I ping ponged potential lyrics for our own version of “Hey Diddle Diddle” while Mom gave her order at the Quik Stop. We debated the effects of the new tax law instated as we lingered there in the parking lot. Then, polishing off the last of the date bar we passed around to split between us, we headed back to the grocery store, split into our respective vehicles, and wound along the country roads, home to the pets and people awaiting. Just another day . . .